I originally posted this in the SWGEmu forums but figured it deserved a post here as well. 3. Unzip files into the "music" folder starting with the lowest number (ex. unzip v1.5 then v1.6 etc.) and overwrite files if prompted. A foreword, this does not bring drastic changes to the music. This is my attempt to add back in some of the high frequencies that were lost during the compression of the game music (and eventually sounds if all goes well). To notice the changes you will most likely have to have at least external speakers or headphones (not in monitor or laptop). I have been playing SWG and SWGEmu since the very beginning and have always found that the music is a huge part of the experience. As time passed and my audio knowledge and setup improved I began to notice that while the audio compression in SWG was not bad, it wasn’t exactly the best either. Ok now on to the good stuff. 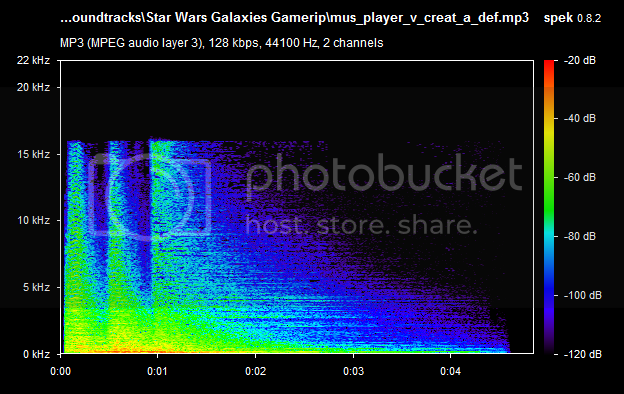 In general the sounds for SWG are compressed down to a 128 CBR MP3 which was great for the time the game was made. A few of the tracks were even compressed using custom encoder settings so the frequencies above 16 kHz didn’t get removed which is great! This is track is actually one of the battle defeat sounds that are used. It is relatively short but it is a good example to show my point. The peaks at the beginning are the brass and cymbals and they are actually supposed to peak over 16 kHz. These frequencies are what give them what I can only describe as luster. Without them cymbals crashes sound flat and the brass is missing the edge that it normally has. It is impossible to restore compressed audio to its original state. It will never be the same as it was when it was in the studio before compression! This is just an attempt to synthesize some of what was lost! My equipment and listening environment are not exactly the best. I am a college student currently living in a dorm and even though I have acoustically treated the room as best as possible (Most of the room is seems to be dedicated to it…) the room is by no means a studio. Even when I use my headphones (EQed mostly flat) and not my monitors, slight coloration of the sound is still inevitable. I have listened to all these tracks multiple times but it is also inevitable that I made a mistake and just glossed over it every time. These mistakes could include sounds unintentionally making it into the recording (Windows dings, etc.) or accidentally clipping a part of the track. I have tried my best to avoid this but yet again it could have happened so if you hear any of them please let me know and I will get right on fixing them. I also want to point out that I haven’t listened to all of these tracks ingame, I have tried my best but there are some parts of the game I just don’t play so tell if anything seems off. Now that that is out of the way I hope you all enjoy it as much as I do! Installing this right now, since I forgot to install from EMU boards... Will let you know! Yeah I am currently working on the ambient tracks but they require a really delicate touch and I am not quite happy with them yet. I will probably get those done later today or early tomorrow. Edit: Just uploaded v1.3 which includes the ambient music as well as the sunrise and sunset themes. Not really a fan of how the themes turned out so I will probably redo them at some point. v1.3 Incremental Patch has been uploaded. Added the mission accepted and completed themes which I believe turned out very well. Also added the various acquisition themes that are trigger in a few places. Unzip the archive and overwrite when prompted. Anyone got a mirror for this? Just a glitch in my hosting.